Specifications For the details, please click the code number below. * Weignt available for holding,conveyance with actual gripper is about 10%of the theoretical gripping,opening capacity. 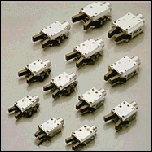 * Switch set is availadle with switch mounted only on the fundamental type.